The IZOD IndyCar Series unveiled the new Championship trophy Wednesday afternoon at Mandalay Bay Resort and Casino in Las Vegas. The trophy to be presented originally was commissioned by Vincent Astor, son of industrialist John Jacob Astor, to be awarded to the winner of the Astor Cup Challenge -- a 350-mile race on a 2-mile board track at Sheepshead Bay, N.Y.
"We sought to blend heritage and tradition with our future," said Randy Bernard, CEO, INDYCAR. "It was very important for us to find a trophy that was a piece of art that drivers would truly be honored to win. At the same time, I think it's very important for us to solidify the fact that INDYCAR is Indy car and we have placed every champion from 1909 on that trophy. We are recognizing every sanctioning body that has governed Indy car racing. It is a trophy that not only reminds us of our past but links our future." 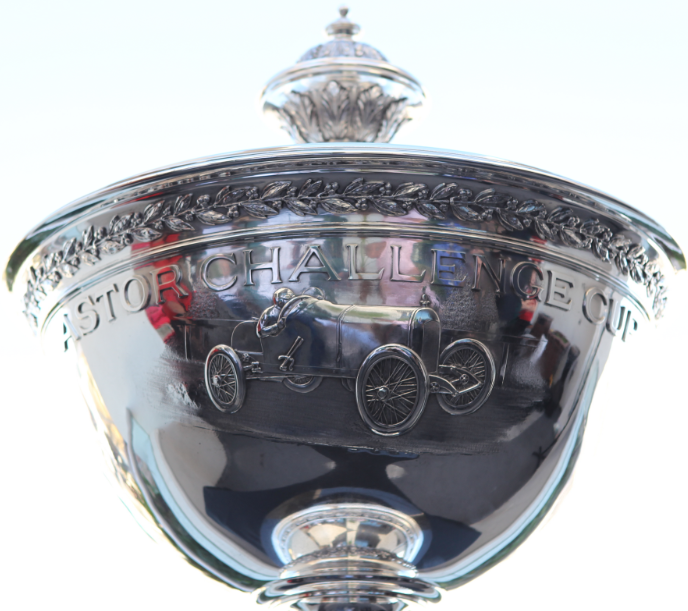 The inaugural Astor Challenge Cup race in 1915 featured a purse of $50,000, which duplicated that of the Indianapolis 500. The Stutz team outlasted a field of 20 to finish first in 3 hours, 24 minutes, 42 seconds. Driver Gil Andersen earned the $20,000 winner's share by averaging 102.6 mph. The second and final Astor Cup race in 1916 was shortened to 250 miles. Johnny Aitken, driving a Peugeot owned by the Indianapolis Speedway Team Company of Carl Fisher and Jim Allison, won with an average speed of 104.83 mph. Aitken, of Indianapolis, has the distinction of starting (41) and winning (15) more races at the Indianapolis Motor Speedway than any driver. A.J. Foyt is second in starts with 36 from 1958-94 and Ray Harroun is second with eight wins from 1909-1911. Aitken also led the first lap of the inaugural Indianapolis 500 in 1911, which was won by Harroun. All Indy car national champions from 1909 (George Robertson; American Automobile Association) to the present are laser-etched into the two black granite bases of the sterling silver trophy. The IZOD IndyCar Series championship driver and team owner both will receive a replica, while the IZOD IndyCar Series World Championship Trophy will be on display at the Indianapolis Motor Speedway Hall of Fame Museum. Target Chip Ganassi's Dario Franchitti leads Penske's Will Power by 18 points heading into the season finale this weekend at Las Vegas.